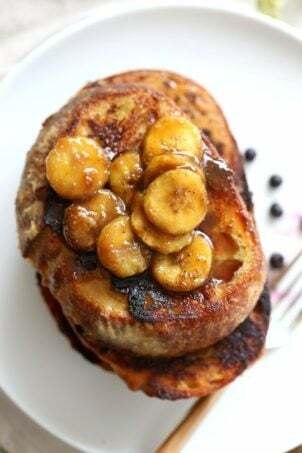 Vegan Banana French Toast. Vegan French Toast with Caramelized bananas. 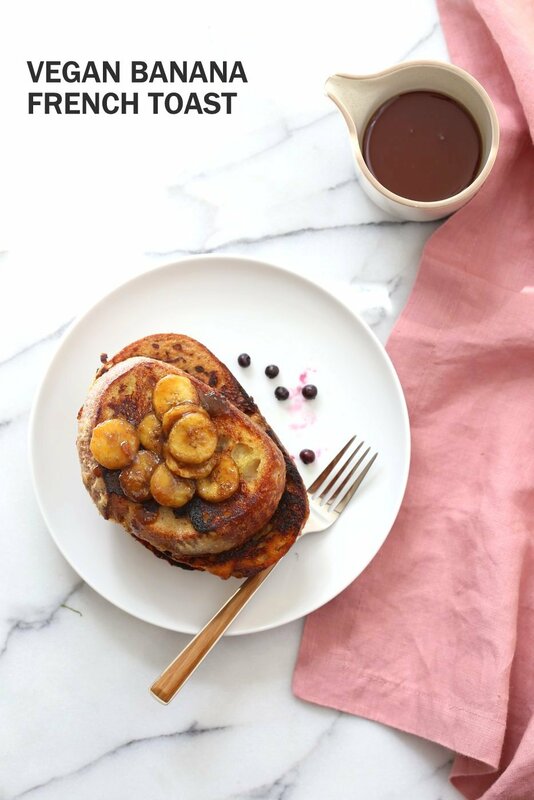 Banana and non dairy milk make up the french toast batter. 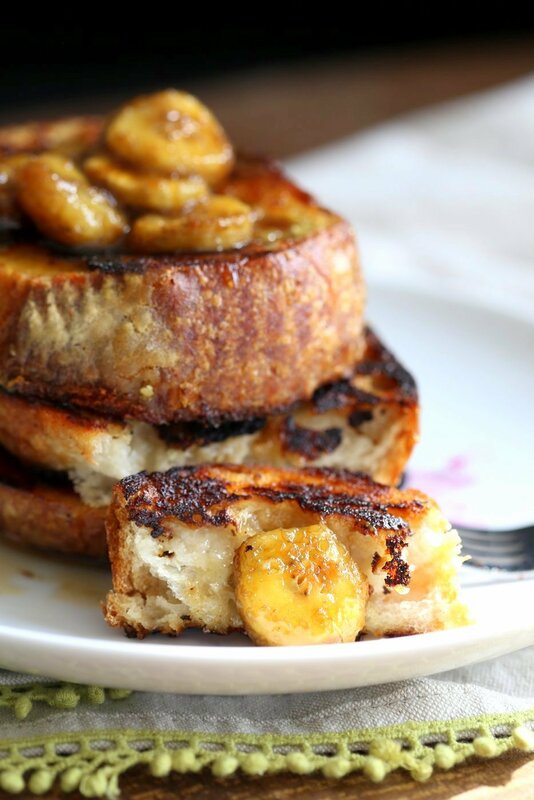 Cooked French toast is served with caramelized Bananas, maple and vegan butter. Nut-free Recipe. This French toast is easy, amazing and delicious breakfast or snack. Hearty Bread is soaked in a batter of banana and nondairy milk, cooked to golden. 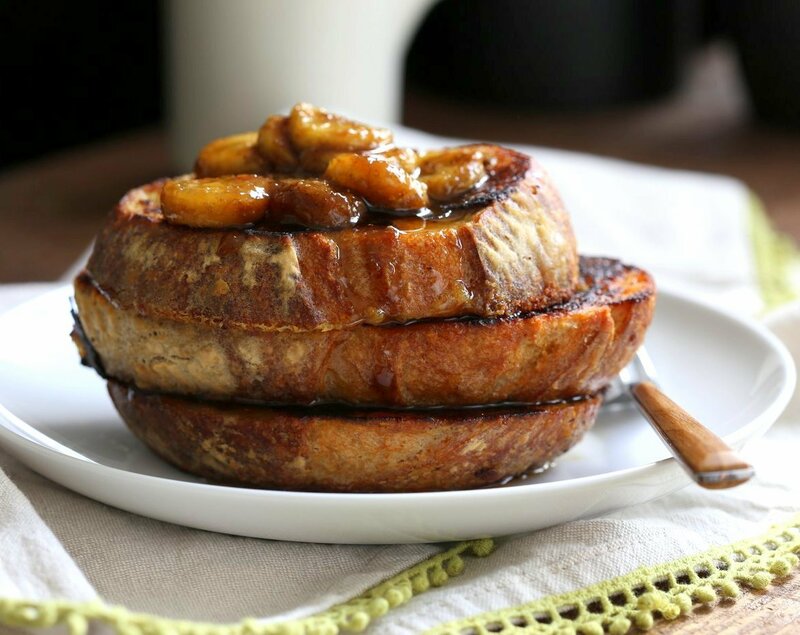 Sliced banana is caramelized with coconut sugar and served over the warm french toast with maple and seasonal fruit. You want to use a rustic bread or a stale bread for best results. Regular sandwich bread can get too soggy. Check with a trial slice to see how long to soak the slice for the best results based on your bread and pan. Soak longer if the french toast is overly dry in the middle. 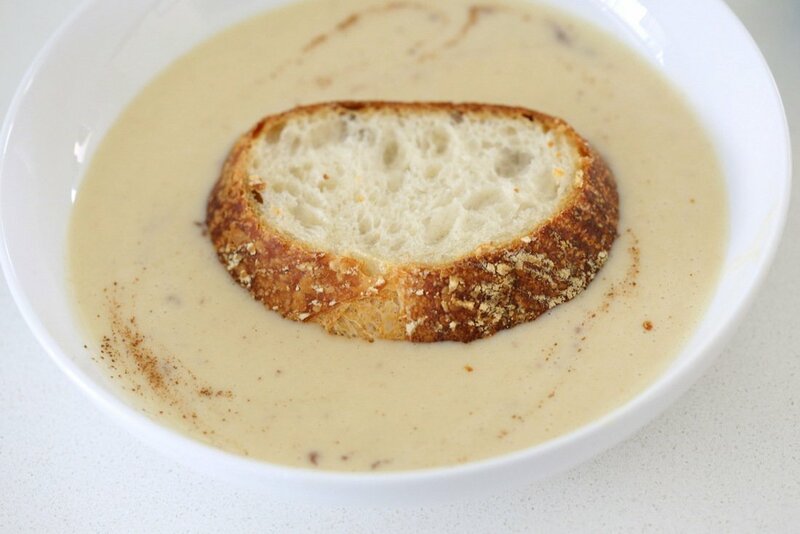 Soak for just a second if the bread tends to absorb a lot of the batter and turns out soggy. You can also let the slices air dry for 15 minutes before using. I like to use my home made wheat or white breads and not overly chewy sourdough from our local bakery to make these vegan french toasts. Blend everything under french toast batter and transfer to a shallow bowl. Heat a skillet over medium heat. Add oil and spread. Place bread slice in the batter for 2 seconds, then flip and soak for another 2 seconds. Remove the batter and let the excess fall off for 2 to 3 seconds. Place in the hot skillet. Cook for 4 to 6 minutes per side. If your stove runs hot, cook at medium low heat. 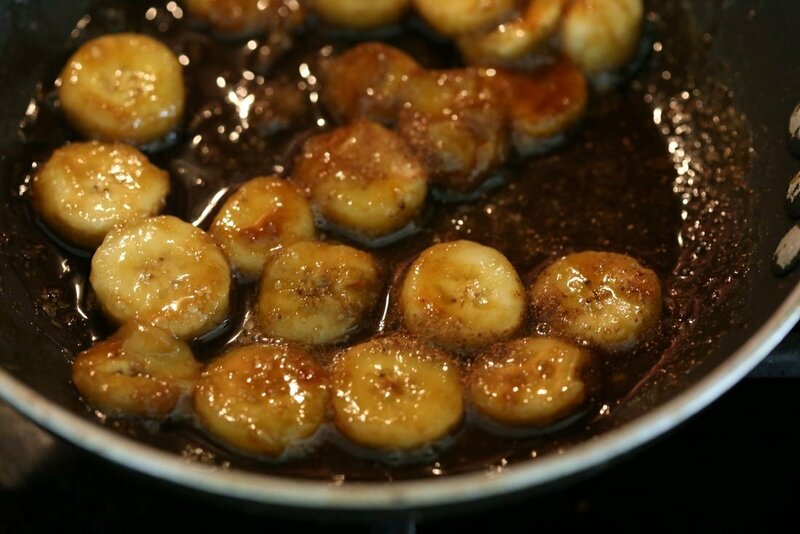 You want to cook the batter really well and caramelize the banana in it but not burn it. If the french toast is not done, the bread will not release from the pan easily. Let it cook another minute or so. Flip and cook the other side. Place in a serving plate, Add a helping of the caramelized bananas, some fresh fruit, maple syrup and vegan butter and serve immediately. Combine banana slices, sugar and non dairy milk, nutmeg and a pinch of salt in a skillet over medium heat. Cook until the mixture thickens. about 6 minutes. Stir occasionally. Make a double batch of these to serve on the side or over oatmeal. how can this be cooked without using oil in the pan? Any oil is 100% fat and goes form my lips to hips. I water or broth sauté vegetables but haven’t found a way to cook things like pancakes without oil. any suggestions? BTW your recipes are the best plant based good tasting I’ve found yet…just wish they weren’t so time consuming. A good non stick skillet might work. You have to let the skillet get evenly hot and maintain it really well to maintain the non stick. Some of my ceramic skillets are very non stick. ie. i can crisp up pressed tofu in them without oil and without the tofu sticking. Pancakes also work on those. Generally i keep separate skillets for pancakes and crepes, for chickpea flour omelets which have veggies in them and so on. I have skillets from Cuisinart Greengourmet, Ecolution and Iko ceramic. For high heat cooking i use cast iron. I keep the eolution and Iko to use for the most non stickiest cooking like crisping up tofu or crepes etc at medium heats. I have 2 skillets that i use for most of the stir fries, indian veggie dishes etc. Cooking vegetables will lead to a lot of wet cooking and a lot of moving things around which seems to reduce the non stick behavior of the skillet and even with oil, the tofu will start to stick after some weeks of use. Also most of the skillets get stickier when washed in dishwasher, so i hand wash them with non abrasive sponge. hope this helps! 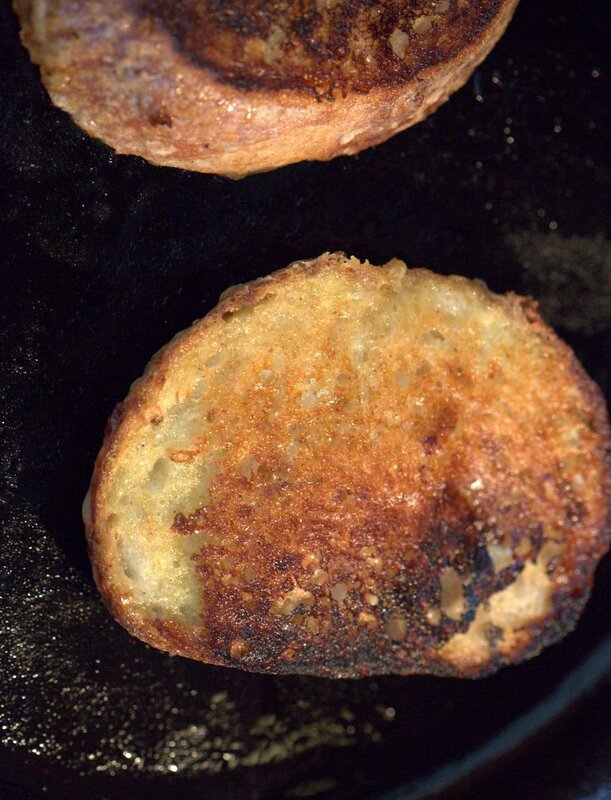 You could try baking the french toast in the oven or broiling with a turn to get both sides. for the batter. You will need some more for the pan depending on the pan used. This looks incredible (mind you, ALL your recipes are incredible). I wanted to ask you, does this recipe make 3- 3 slice servings? yes. you can double the caramelized bananas for a hearty serving. Hi! Can We substitute the unbleached white flour?? Ei, garbanzo flour? This was so delicious! Made with day old Challah and it worked out great. Hello Richa, just wanted to thank you for sharing this fantastic recipe! It is truly divine. I’ve just made some for breakfast, topped with organic blueberries and coconut yoghurt! Heavenly! Love your recipes! can this be prepared the day before ? You can prepare the batter and keep it. for a overnight french toast bake kind of option, the batter might need changes so all of i doesnt get absorbed into the bread. So yummy! My husband isn’t vegan and he said it’s the best breakfast I’ve ever made him! Can I sub with normal wheat bread? yes, some breads are too soft and they tend to get soggy, so use a sturdy bread or stale bread. Should you use plain almond milk or vanilla almond milk? Thank you!!! Can I make the french toast part of this recipe & freeze it to use at a later date? (Not just the batter.) I would make the bananas they day I serve it. Thanks! The key is making sure it’s well browned before you flip it. If you flip it too soon the nice browning will peel off. MUST use non-stick and a light spraying of oil. When the top starts looking a little dry then flip. My vegan daughter LOVES this recipe. And if you aren’t vegan, like me, a nice breakfast sausage is a great side! The sweet and salty contrast is amazing. I made this in a nonstick skillet without any oil and it didn’t stick at all. You have to let the french toast sit in the batter and cook for a good 5 minutes without trying to move it. 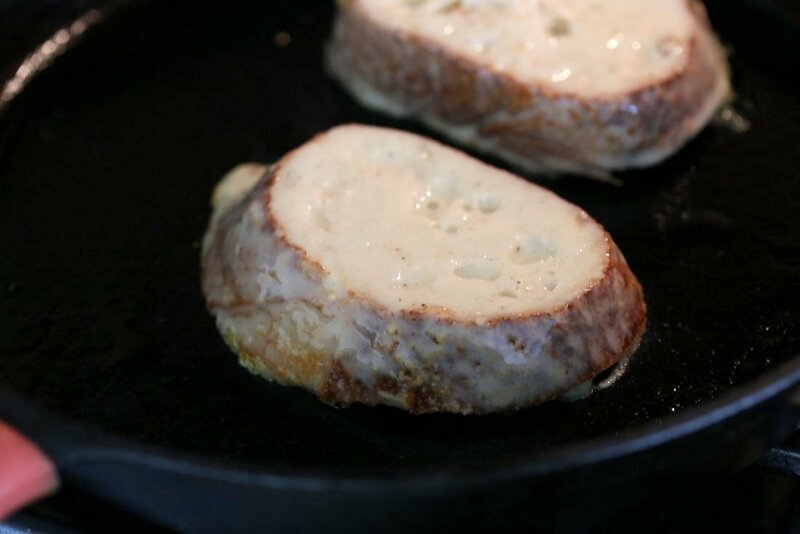 It caramelizes in the batter and hardens a bit, making it easy to flip. I used a thick, day-old sourdough bread. The only thing was that this was very, very sweet and pretty much tasted like bananas and maple syrup, due to the bananas and maple syrup in the batter as well as the caramelized bananas. If I made this again, I would only use a couple teaspoons of maple syrup in the batter and a little less brown sugar on the bananas, or maybe use a fruit compote instead to add a tart component. Thanks! I usually serve these with some fresh fruits and nutty granola so they balance out the bananas. You can mix and match and adjust the sweetness to preference.